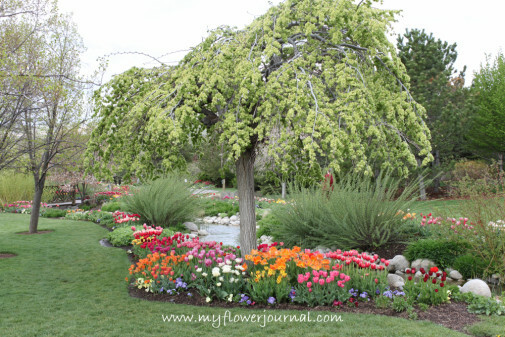 One of the best ways to celebrate spring in Utah is to attend the Tulip Festival at Thanksgiving Point. This festival is probably the most spectacular garden event in Utah. 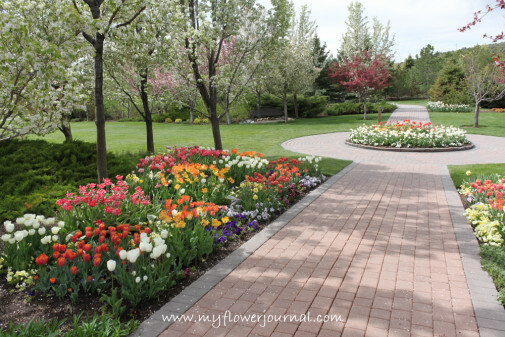 Thanksgiving Point is a 55 acre garden located in Lehi, Utah. Each fall they plant 250,000 tulip bulbs in 70 colors and 100 varieties. This year the Tulip Festival was held April 12-May 4. (Closed on Sunday.) Garden tours and demonstrations are held daily during the three week festival. On Fridays and Saturdays you can enjoy music, vendors and food in addition to the beautiful scenery. Many gardeners and volunteers work hard to make this event enjoyable for everyone, but Mother Nature is in control. You usually have to plan your visit between rain, snow and wind storms and hope for a sunny day that fits your schedule. Luckily the Tulips are tough enough to handle our variable spring weather and are ready put on a colorful show.